The sky turns orange and the clouds turn yellow. Sunsets like this one have hung in galleries for centuries. A slight breeze rises – the lungs of the earth inhaling warmth, exhaling coolness. The breeze brings a faintly watery smell, even though the sun still warms the tops of trees. Beneath the trees, in cool green-black shadows, night begins, spreading a transitory stillness that will soon fill with the Invisibles – hyenas, leopards, lions – beginning their nightly rounds. 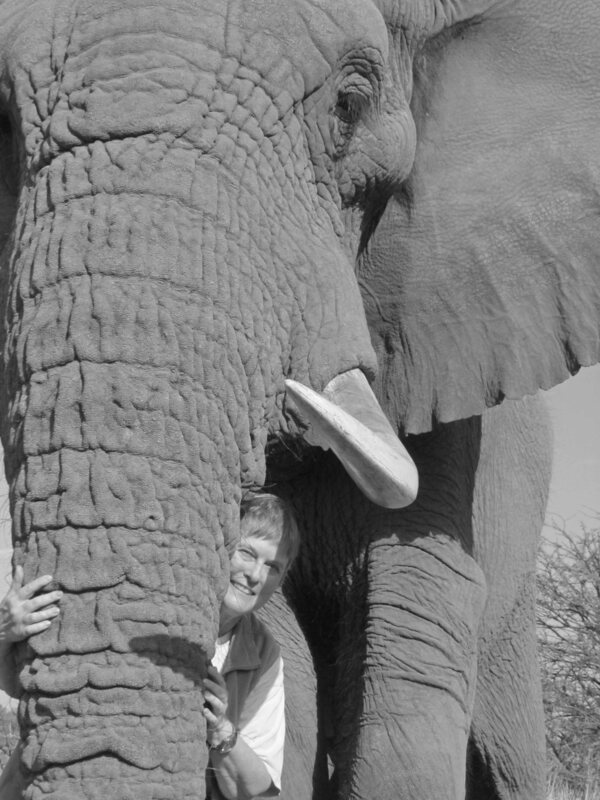 So many tales to tell: (1) the flooded Okavango Delta, water where there was sand last time I visited; (2) walking with elephants under starlight and a half moon (without a flashlight); (3) hyenas in the kitchen; (4) the closest I’ve ever gotten to a snake (! ); (5) a leopard for my friend’s birthday present; (5) lions kill a baby hippo; (6) basic tents and luxurious chalets; (7) what not to do if you’re self-driving through the Moremi Game Reserve (hint: DO NOT rely on your GPS); (8) wild dogs, wild dogs and more wild dogs; (9) the rarest giraffes in the world; (10) hippos, hippos and more hippos; (11) a leopard hunts a male impala; (12) an absolutely wonderful stay with Sandi, Doug, Jabu, Morula and Thembi – and many, many more. Stay tuned! The sofa never had a chance. A pack of frenzied hyenas can devour a four- hundred-pound zebra in less than half an hour, eating everything: bones, skull, hair, even hooves – leaving only a smear of blood on the ground. 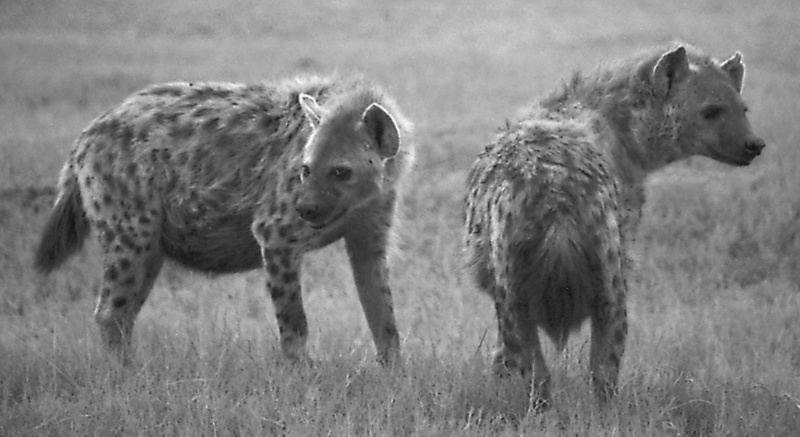 With a bite pressure of over a thousand pounds, hyenas pulverize and swallow enough bone their feces turn chalk-white. They will filch anything not locked up: boots, toothpaste, shaving cream, underwear, soap, even bottles of hot sauce. What’s glass to a creature that can eat a zebra’s hoof? In the case of the sofa, they ate the leather and left a gnawed wooden frame. “Why the sofa?” I asked the manager. I imagined the scenario: in the dead of night the hyenas climb a set of wooden steps into the dining lounge, shove aside several tables and chairs, pull the sofa from the lounge down the steps and drag it the length of a football field to deposit it at the lagoon. “Just the oil from human hands.” He rubbed a palm across the sofa’s replacement. It too is leather. I tried not to think of it as also doomed. A well-known hyena den is very near the main road to Stanley’s Camp. Since I had some time before Doug arrived in his 3F, one of the guides drove me over to the den just at dusk. As we sat quietly, motor off, a lone Spotted Hyena tentatively emerged from the den. She had the usual hyena slouched profile: massive head and shoulders tapering to small, tucked-in hindquarters – a hybrid creature: half fearsome predator, half coward. The second largest carnivore in Africa, (after the lion), the Spotted Hyena is larger than her Brown Hyena cousins. Her family is more aggressive, too – a single adult, weighing at the most 140 pounds, is capable of hunting and killing a bull wildebeest of 600 pounds. Although hyenas kill ninety-five percent of what they eat, they also loot the kills of leopards, lions and cheetahs at every opportunity. Lions can’t digest hair and bones, but hyenas are happy to do that for them. Grinning her famous false smile, the hyena sat at the entrance of the den and turned her black, empty eyes toward us. Less than a moment after, black fuzzballs erupted behind her. As she returned each pup to the den’s entrance, another escaped and then another. The grinning, panting, anxious nanny seemed to be having a nervous breakdown. I would have considered the pups cute, except for the hyena’s awful reputation. Last night, when I mentioned the sofa, Sandi told me that hyenas had killed an eleven-year-old American boy several years ago at the Xakanaxa (Kah-khan-a-kah) Campground, thirty miles northeast of here. Despite the young age of her son, the mother allowed him to sleep by himself. Awakened by crazed laughter, the guide saw a huge female hyena dragging the boy’s partially eaten body into the bush. Guides from nearby camps helped locate what was left of the decapitated body, driving away the hyenas and guarding it until daylight. For two years afterwards, his mother haunted the streets of Maun and the area around Xakanaxa, carrying her son’s ashes, looking for clues as to how he died. Did he leave his tent unzipped? Did he have food in his tent? In the parks and game reserves of Africa, you never, never sleep with your food. At Doug and Sandi’s kitchen shelter anything even remotely edible is secured in heavy metal lockers or inside a propane-powered refrigerator. Over at Stanley’s, food is kept behind the heavy doors of a wood-frame kitchen. Watchmen patrol the camp. Last night I double-zipped myself into my tent – first the heavy outer canvas flap, then the inner mesh. Hyenas are opportunistic and would walk right in if my tent were open. Hyenas hunt in packs and mostly at night, so I was grateful to find an enamel chamber pot on my side of the zipper. This morning, I emptied the pot into the “African long-drop” located near my tent. The “long-drop” is a plastic commode fitted over a hole in the ground that’s about five feet deep. No walls, no roof, no door – just the surrounding bush, a hole in the ground and me. Next to the commode a small shovel sticks upright into a pile of ash. I raise the lid, empty the chamber pot, and shovel in ash and close the lid. No smell, no flies. I much prefer African long-drops to American outhouses. 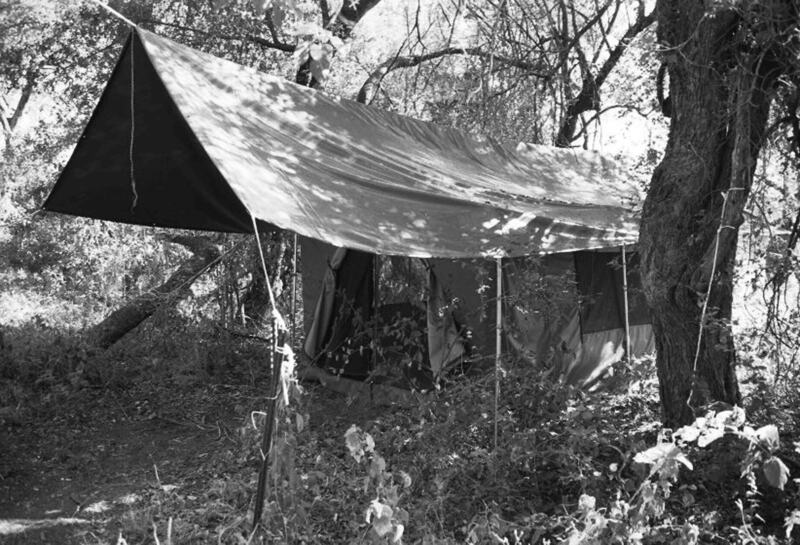 I rinse the pot from the spigot outside my tent, throw the water out into the brush, stash the pot back inside the tent, wash my hands in a basin under the spigot, toss that water, replace the basin, stash the soap back inside my tent, and zip it shut. No hyena’s gonna scatter my stuff all over Africa.